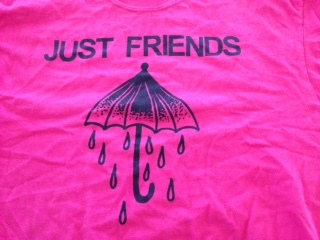 Just Friends comes from the Dublin/Pleasanton area of Northern California. I got turned on to them by my friends back home in San Jose who sent me their demo. 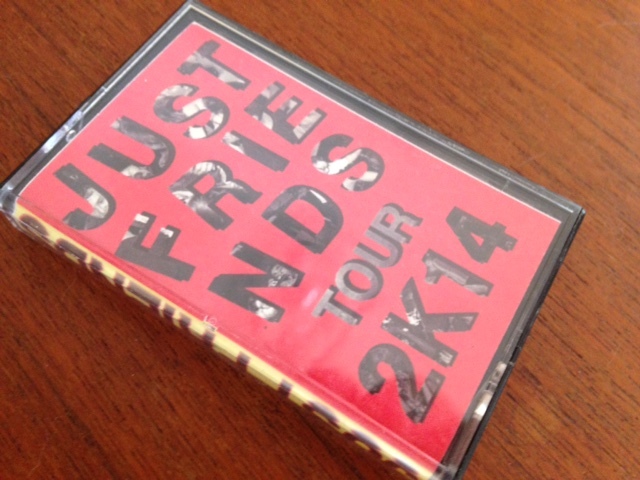 They have been going strong with a few digital releases and tour tape under their belt. Rock 2 The Rhythm is out on Open Door Records run by Ozzy and Dan Ramirez. The physical copies have not shipped yet but I got a test pressing from Dan. Rock 2 The Rhythm is a really interesting. Musically, I really enjoy this record. It is refreshing to hear. No one in the California area is really making music like this. It is not ska. It is not punk. It is Just Friends. You can really feel how much fun this band had making this record. Lyrically, I find this record interesting. People will either hate or love Sam’s voice. I really like it. I think that it is important to have a unique voice that stands out. Sam’s lyrics are extremely simple, which is not a bad thing. It allows the listener to really make what they want of it. When I hear this record I see a story. 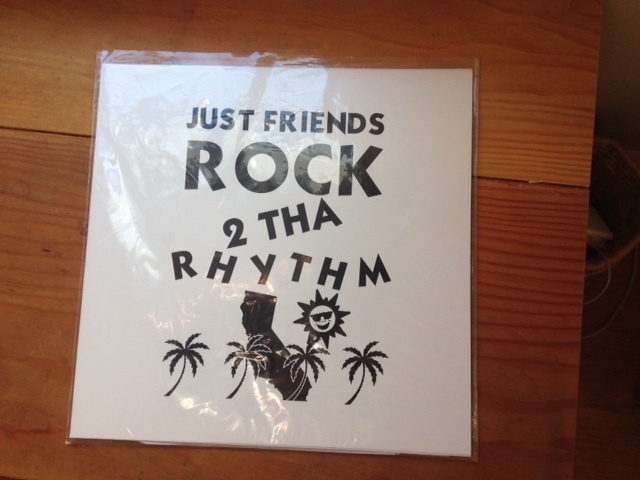 Sam has let me into a very personal story of a breakup and Just Friends wrote a record about it. I hope this record was a cathartic experience for him to just let it all out on the table. I look forward to the extremely politically driven sophomore LP. I am gonna highlight some of my favorite jams on this record. BTW, the first side of the record is near perfect for me. Shots Fired – This is the moment of the breakup. Musically, this really captures what it is like to be at a Just Friends show. This record is good, but they are really something special live. Ryerson – This song is the cordial process of the breakup. Sam is pretty sarcastic in this song and is patronizing the person that he is splitting from. It is a obvious coping mechanism so that he doesn’t have to deal with the sadness of it. Welcome Mats – After some time Sam misses this person and tries to get in contact with them and they are just freezing him out. He just wants talk because he is actually sad about the breakup. Bad Weather II – This is the best Just Friends song on the record. It might be their best song ever. This song plays like a shirt that JF used to sell. When I hear this song, I see Sam holding that umbrella and singing this. DANG MUSIC VIDEO IDEA. Sam has found out something about the reason for the breakup. He is fully consumed by it. I am guessing some kind of cheating. The line he keeps repeating is really intense. “I don’t know what to do now if my life moves on without you.” The line sounds really simple, but it is really raw and vulnerable. He does find some silver lining. Since this person haunts him it means that they will never leave him. Normal Me/Graduate – These songs are sung by Kent, I believe. It is nice to have some diversity in singing duties. These songs compliment the main arc of Sam’s breakup. Dublin, CA – Sam is realizing everyone in the band/life/home could be leaving him soon. He is facing the fact that everyone grows up, gets a job and yadda yadda. He realizes that when everyone is gone, all he will have is this breakup. I wanna give Sam a hug and say that life has a lot to offer in your 20s and this breakup will pass. Sam gives out hella shout outs at the end of the song. It bookends the first track really nicely. This record is really solid. You can listen to it digitally almost everywhere. Here is a link to their record on bandcamp. If you want to buy the vinyl, here is a link.